Counting Down to Expo West 2015! The Jeff’s Naturals team were all smiles at Natural Products Expo West last year. As members of the growing natural products community, we always look forward to our annual trek to Anaheim, CA for Natural Products Expo West, the world’s largest trade show for the natural, organic and healthy products industry. The Jeff’s Naturals team cannot wait to connect with the thousands of attendees looking for the newest and most innovative natural, organic, and healthy lifestyle products the weekend of March 5–7, 2015. 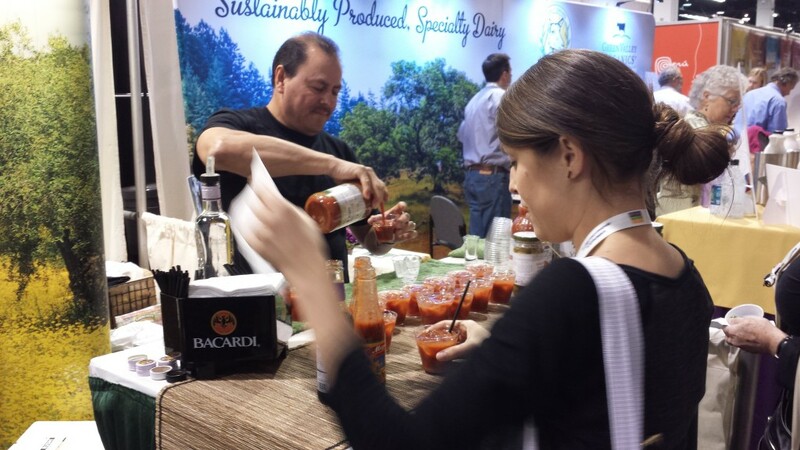 Jeff’s Naturals joined Lakewood Juices and Tillen Farms to host a very popular Bloody Mary Bar at the 2014 Natural Products Expo West event. If you have never been to Expo West, it is quite the experience! Our Bloody Mary Bar from last year’s event was such a hit, that we have decided to reunite with Lakewood Juices and Tillen Farms to host another special cocktail hour (for attendees 21 and up) at the 2015 event! We hope you will visit the Lakewood Juices Booth, #2816, and the Tillen Farms Booth, #2673. 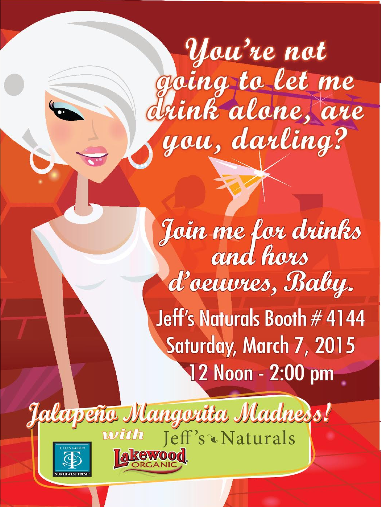 Then, be sure to stop by the Jeff’s Naturals Booth, #4144, on Saturday, March 7th from 12 p.m. to 2:00 p.m. for some fun Jalapeno Mangorita Madness!! Natural Products Expo West is the premier trade show for the natural, organic and healthy products industry. With an estimated 60,000+ attendees and 3000+ exhibits it is also the largest. The annual event showcases the newest products in natural and specialty foods, organic, health and beauty, natural living, supplements and pet products. To learn more, visit expowest.com. Try Samples of Jeff’s Naturals Olives at PCC Natural Markets this Month! Businesses that are owned and operated by a group of individuals for their mutual benefit, a.k.a. co­‐ops, are commonly recognized as a force for positive economic and social change throughout the world. We are proud that consumers can find Jeff’s Naturals products in food cooperatives across the United States, including PCC Natural Markets. Puget Consumers’ Co-op (PCC) is a certified organic co-op with 10 stores in the Seattle and Puget Sound area, specializing in all-natural foods. As the demand for natural foods continues to increase, organizations like PCC continue to evolve to accommodate more families. In fact, what began as a small food-buying club in 1953 has grown into the largest consumer-owned natural food retail co-operative in the United States. PCC Natural Markets is more than just a business. It is a growing group of individuals who strive to educate its members about food and environmental issues, and create a marketplace for organically grown foods. We understand why more consumers value the options offered at natural-products stores. Our natural line of olives, peppers and specialty items were developed to meet the needs of health conscious individuals searching for more natural alternatives free of preservatives, sulfites and GMOs. This month, PCC Natural Markets has been offering taste samples to shoppers in various stores to try our stuffed Olives. If you are in the greater Seattle area, we hope you will stop by these locations to try them out for yourself!